At the 2003 SHOT Show, Smith & Wesson introduced to the shooting industry a new and massive revolver, built on what they refer to as their new X-frame. The new frame was built especially for their newest handgun cartridge: the .500 Smith & Wesson Magnum. The new frame is the largest ever built by S&W, but with a few changes is very similar to the double-action design that has proven reliable for over 100 years. The removable side plate and internal parts will be familiar to anyone who has ever worked on a S&W revolver, just built on a larger scale. After reporting on the introduction, and a few photos from the SHOT Show, I have been anxiously awaiting the arrival of the new .500 to give it a try. Unlike some magazines, Gunblast does not publish a "test" of a gun until we actually shoot it, and shoot it a lot. By the time the big Smith arrived, I had already secured a quantity of ammunition from Cor-Bon, who worked with S&W on the development of the cartridge. Upon opening the blue plastic hard case, the stainless Five Hundred is an impressive sight. My first thought was: "Now THAT’S a big gun!" The barrel length on the sample received measures eight and five-sixteenths of an inch in length, plus an additional three-quarters of an inch for the ported compensator attached at the muzzle, resulting in an overall gun length of about fifteen inches. 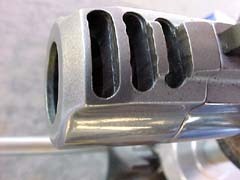 The barrel also is of the full underlug design, as are many of Smith’s other large revolvers, and has a full-length solid rib on top, into which is set an excellent interchangeable front sight. 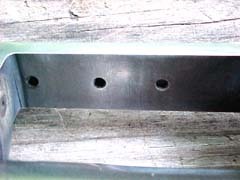 The five-shot cylinder measures a hair over two and one-quarter inches in length, and has a diameter of one and seven-eighths inches. My sample .500 Magnum weighs in at just under seventy-three ounces. This gun makes the S&W .44 magnums look small. The .500 Magnum actually handles much better than it would appear. 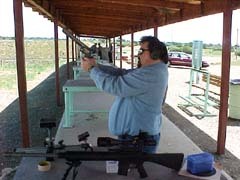 The balance is toward the muzzle, but it hangs very well in the hands, and is easy to hold on target. The Five Hundred wears a good set of adjustable sights of the familiar Smith & Wesson design. The front post sight was thankfully left black, and provides an excellent sight picture. 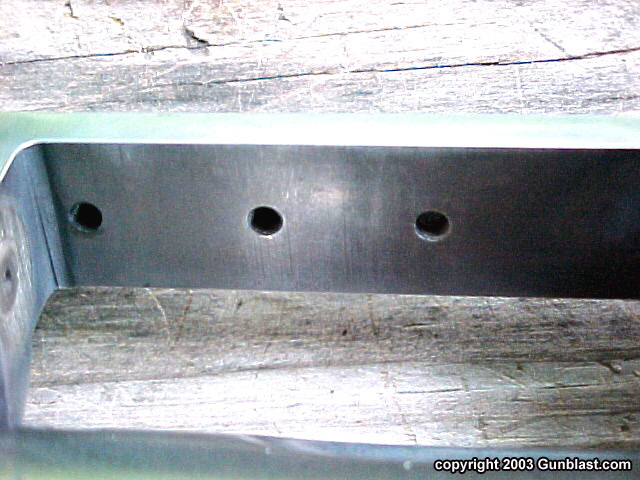 The top strap under the rear sight is drilled and tapped for a scope base, which might be desired by some shooters, particularly those who hunt in low light conditions. The grip frame on the new .500 is the same size as Smith’s K and L frame revolvers, and wears a set of Hogue soft rubber finger-groove grips. The grips cover the backstrap of the grip frame to cushion the web of the hand from recoil, and provides a bit more trigger reach, which is very comfortable to my hand. 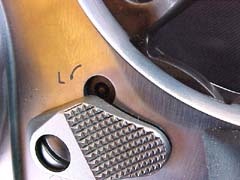 The cylinder lockup is a new arrangement for a Smith & Wesson revolver. In addition to the standard rear cylinder pin lock, the crane locks to the frame with a ball detent setup, resulting in a very secure alignment of the cylinder with the barrel and frame. The action has Smith’s new internal key lock for safe storage of the revolver, if that is a concern. It is unobtrusive, and can be either implemented or ignored as the owner sees fit. The single-action trigger pull measured just under a crisp four pounds, but feels lighter due to the wide target trigger. The double-action pull measured a smooth ten pounds and three ounces, but once again felt lighter than that. The checkered hammer spur falls right under the thumb for easy cocking. 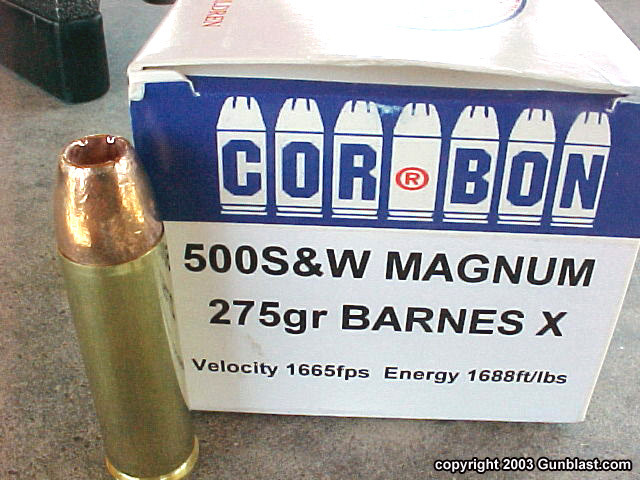 As previously stated, the ammunition for the big Five Hundred is produced by Cor-Bon in Sturgis, South Dakota. 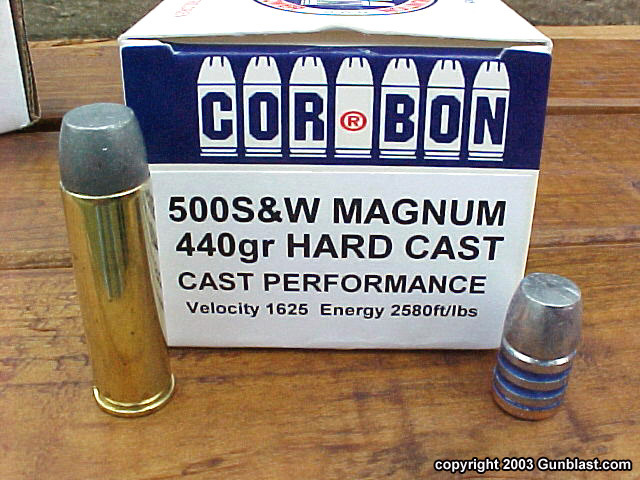 Cor-Bon is well known for producing premium quality high-performance ammunition. The specifications for the new S&W magnum include a 275 grain Barnes hollow point at 1665 feet-per-second, a 400 grain Hawk soft-point at 1675 fps, and a 440 grain hard cast gas-checked Cast Performance flat nosed lead bullet at 1625 fps. 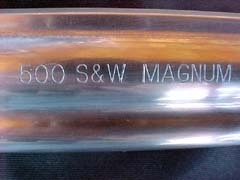 The case length for the big magnum is 1.625 inches. While I wasn’t able to obtain any of the 400 grain ammunition, I had both the 275 grain load and the 440 grain load available for testing. As you can readily see from the specs, both the 275 and the 440 grain loads are traveling at about the same velocity, and are really each in their own class. The Barnes is built to open up quickly upon impact, and the 440 grain Cast Performance bullet is built for deep penetration on the toughest flesh and bone. Getting the big Five Hundred ready to shoot, I didn’t really know what to expect. 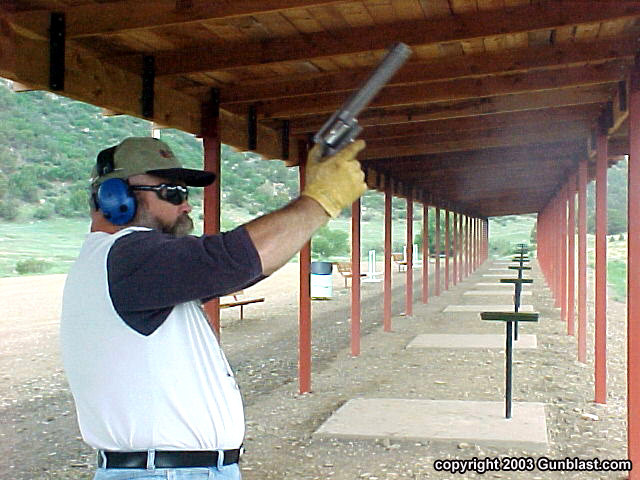 I have fired many large magnum revolvers and single-shot pistols, but the new Smith was an unknown to me. Stuffing five of the big cartridges into the cylinder is like poking big brass sausages into a stovepipe. Everything about this gun seems oversized, somewhat like it’s not even real. It reminds me of the guns seen on the old Saturday morning cartoons; where the coyote pulls a gun out of his pocket that is as big as he is. Anyway, preparing to shoot the new Smith, I donned my shooting glasses and hearing protection, then as a last thought, I grabbed a hard-hat just in case the big gun decided to slap me in the forehead. Dropping the hammer on the first round, it was readily apparent that something big was happening, but the recoil was nothing like I had expected. 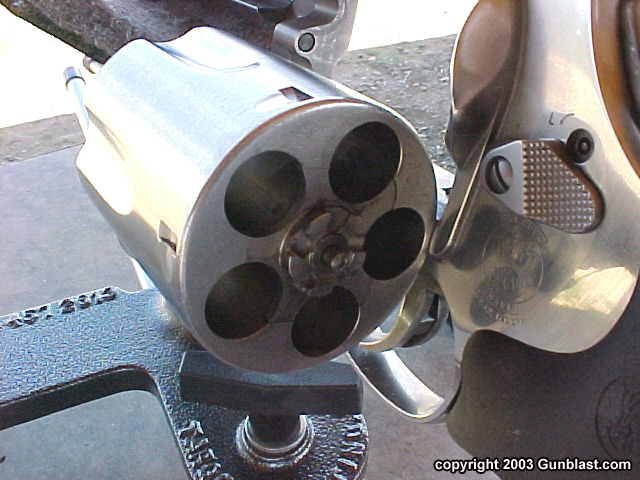 In fact, I found the gun to be very controllable, especially with the 275 grain loads. 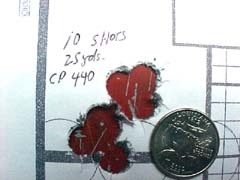 Even the 440 grain hard cast loads, while producing much more power, were not painful to shoot. The ported compensator and soft rubber grips apparently do their jobs very well. 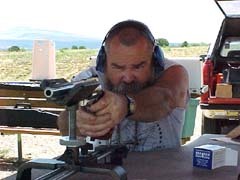 While at the NRA Whittington Center in New Mexico, I invited several experienced shooters to try the big Smith, and while a few were a bit reluctant at first, no one found the gun painful to shoot. I have fired some of the latest incarnation of super light pocket .357 magnums, and find them to be more punishing to fire than the Five Hundred. While packing more punch than the original .45/70, and with a fatter bullet, the .500 S&W Magnum is very manageable for an experienced shooter. I fired the new Smith at various targets ranging from paper at twenty-five yards, to steel silhouettes out to four hundred yards, and rocks at over five hundred yards. I found the new X-frame to handle the new cartridge very well, producing satisfying hits, when I did my part. As can be seen in the photos, the new gun is very accurate on paper at 25 yards, which is the standard that I use when testing handguns with open sights. If I could hold better, I believe this gun would place every shot into the same hole! I would love to try it with a scope mounted. One problem was encountered with the new Smith and Wesson. 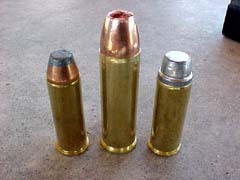 Reliability was perfect with the lighter 275 grain loads, but a problem occurred with the heavier 440 grain ammunition. With about half of the shooters who fired the gun, the cylinder would rotate slightly backwards with recoil. The cylinder did not unlock and swing out, but it would rotate upon firing. After observing several shooters, the degree of rotation was traced to the way that the gun was held upon firing. 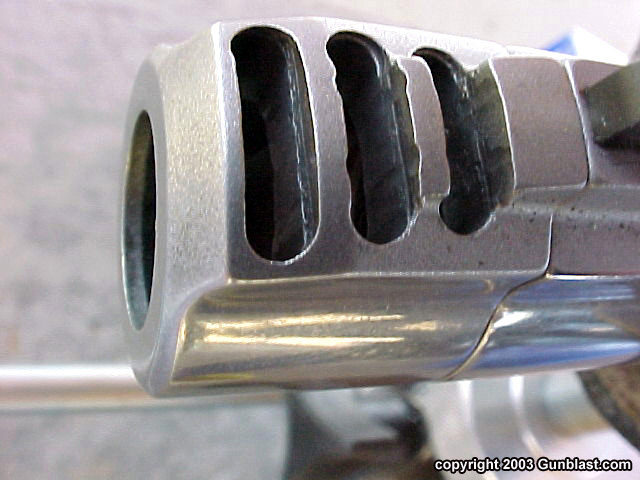 The tighter the gun was held, and the more rigid the arm position, the more the cylinder would rotate. 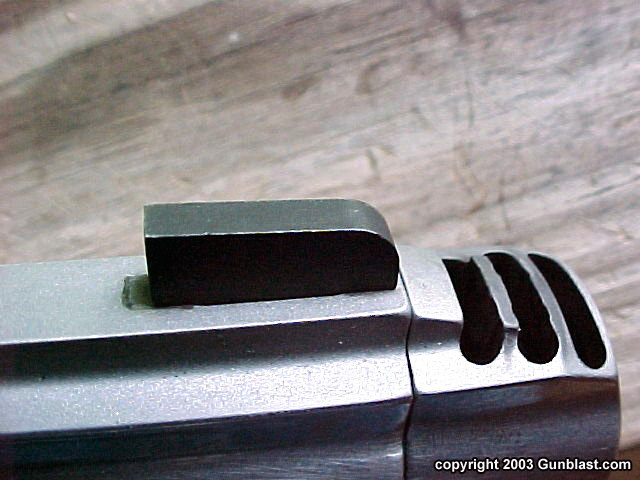 It happened to me every time with the 440 grain loads, and figuring out the cause of the problem was driving me crazy. I also know of two other guns that exhibited the same problem. I finally figured out that the cure was as simple as a slightly stronger cylinder stop spring. After installing the heavier spring, the problem went away immediately. The gun had been recoiling away from the cylinder stop, releasing the cylinder to rotate. The factory is aware of the gremlin, and it should not be a problem on future guns. Smith & Wesson is absolutely committed to building quality products, and is always quick to fix a problem when it occurs. The .500 S&W ammunition from Cor-Bon performed a bit better in my gun than advertised. 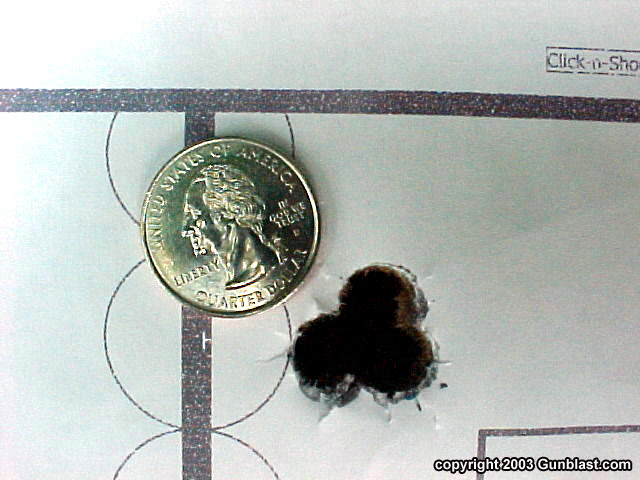 The 440 grain Cast Performance load chronographed at 1662 feet-per-second ten feet from the muzzle of the test gun. This is awesome power from any kind of hand-held ordnance, and is capable of taking any game animal on the planet. I know from experience that the Cast Performance bullets hold together very well for deep penetration, even when busting through tough bone. The lighter 275 grain hollow point should prove excellent for thin-skinned game. As with most any new firearm or cartridge, especially one that exceeds the performance of existing technology, the question always comes up: "……but what is it good for?" I asked this question myself at first, but after shooting the new Five Hundred, I have come to realize that the gun packs tremendous power into a portable package. 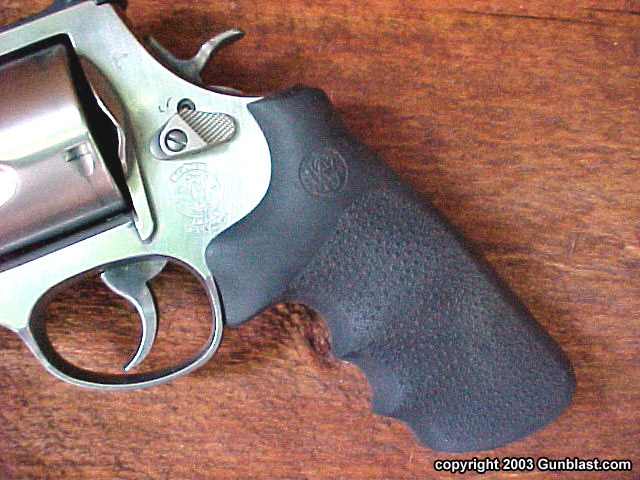 While the gun is large, it is not cumbersome, and carries well in a good across the chest holster. It has the power to take very large and dangerous game, holding five of the fat magnums, each delivering up to 2600 foot-pounds of energy with factory ammunition, and delivering outstanding target-grade accuracy in the process. Even for shooters who will never hunt large bears or the wild bovines of Africa, many will still want to own the big Smith. Much like the thousands of large bore rifles that are sold each year, most will never be called upon to save the owner from extermination in the claws or hooves of some wild beast, but it is enjoyable to shoot the big rifles anyway. Every rifleman should own at least one dangerous game rifle, and every handgunner should own a Magnum. The new .500 Smith & Wesson magnum is the handgunner’s version of the African rifle. It is good to own one. Check out the new Five Hundred online at: www.smith-wesson.com. 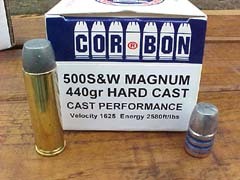 Ammunition for the big S&W .500 can be ordered directly from Cor-Bon at: www.cor-bon.com. 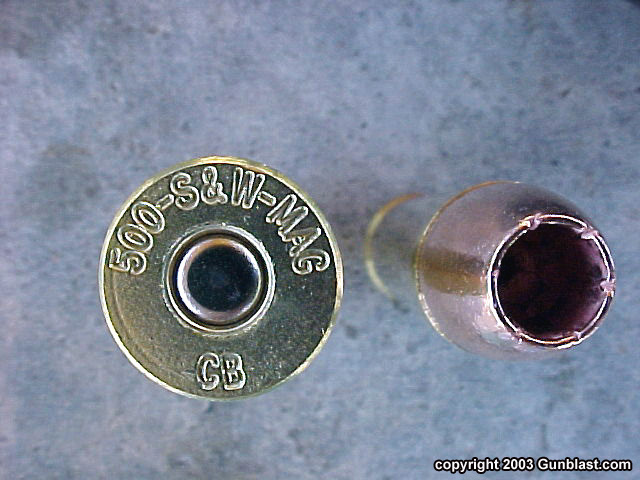 Look for an article here on Gunblast.com about hand loading for the .500 S&W Magnum. I have been working up some accurate and powerful loads for the new gun, and will have the results available soon. 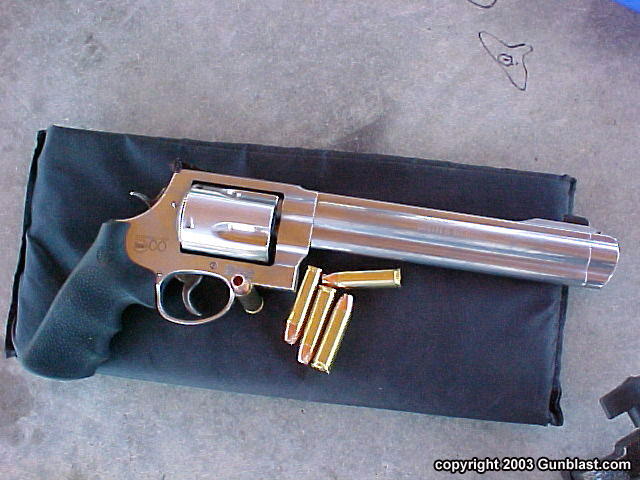 Smith & Wesson's big .500 Magnum: a big-bore powerhouse that is surprisingly accurate and controllable. A joint venture between Smith & Wesson and Cor-Bon Ammunition, the .500 Magnum is unlike any gun/cartridge combo introduced to date. 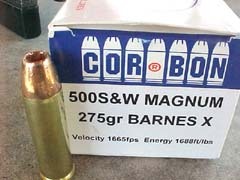 The "light load" for the big .500 propels a 275-grain Barnes X-Bullet at over 1650 fps, while the "heavy load" zips the excellent Cast Performance 440-grain bone-crusher at a similar velocity for over 1.25 TONS of muzzle energy! Shown at center, the .500 Magnum dwarfs the .44 Magnum (left) and .45 Colt (right). 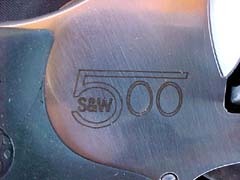 Smith & Wesson designed the Five Hundred as a "five-shooter" for maximum strength and safety. Another aid to safety and positive lock-up is a ball detent arrangement that effectively locks the crane to the front of the frame. Another safety feature is Smith & Wesson's new internal key lock system for safe storage, which is unobtrusive and can be ignored at the owner's discretion. The Five Hundred sports a ported compensator on the muzzle and Hogue soft rubber grips. These features, coupled with the weight and slight muzzle-heavy balance of the gun, combine to provide a surprisingly painless shooting experience. Iron sights are excellent, pairing Smith & Wesson's famous adjustable rear sight with a well-designed interchangeable front sight. For those shooters desiring greater precision in a hunting revolver (or those who just think the big Smith ain't big enough! 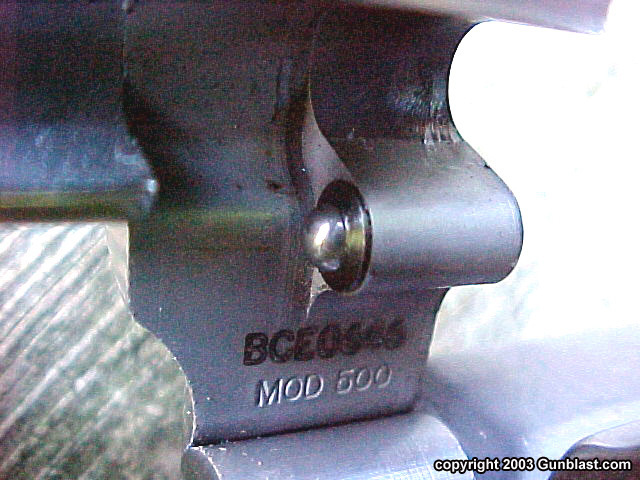 ), the Five Hundred is drilled & tapped for a scope base underneath the rear sight. Both the author and the webmaster were very impressed with the big .500. Jeff and Boge have fired the gun extensively, and both found the gun to be easier to shoot than expected, as well as very accurate. 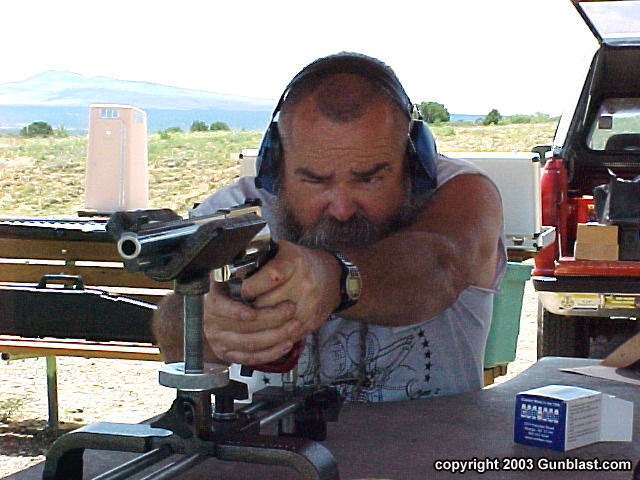 As can be seen here, the Smith & Wesson Five Hundred is capable of superb accuracy. Fired at 25 yards, the gun grouped three shots into one ragged hole, and ten shots into 1.045". This is about as well as we can shoot any revolver with iron sights! Practical? Well....maybe if your style of hunting leads to the possibility that you might have to blast a large beast with no sense of humor off your mama's favorite kid. For the rest of us, you know you want one....you can think up a use for it later!